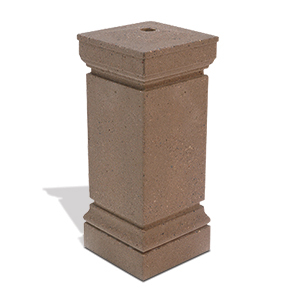 The column smokeless concrete snuffer provides a sophisticated touch to exteriors while discretely concealing any extinguished smoking debris. The detailed column stylings with a compact design, the snuffer allows easy and convenient cigarette disposal. This smokeless snuffer features a 1-1/4" opening to dispose of the cigarette butts which will be collected in a galvanized steel bucket inside the unit. Servicing and removing the ash is fast and simple the unit features a stainless steel door to conceal the collection bucket and material debris. This sophisticated snuffer is constructed entirely with reinforced concrete, capable of withstanding the most demanding environments while keeping its original beauty. Available in an array standard and premium colors and finishes.